Whether you’re a novice home hobbyist or a seasoned professional stitcher, experience the full-featured performance of embroidery machines from HSN. 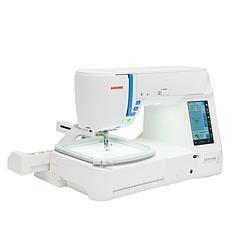 Find embroidery sewing machines by top names in the business, like Singer and Brother. Personalize, monogram, and embellish any project using all the functions and accessories you want in an easy-to-use embroidery machine. Even beginners can start designing right out of the box. Take advantage of hundreds of built-in stitches, or download endless embroidery patterns right off the internet to achieve magnificent, professional, and sophisticated results. Embroidery machines that connect directly to a USB port on your computer offer the chance to discover even more embroidery skills and ideas. Create one-of-a-kind designs, and your embroidery machine’s internal memory will save your favorite settings for a more personalized sewing experience. 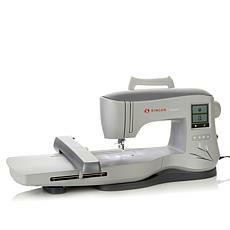 Combine sewing and embroidery functionality with feature-rich embroidery sewing machines, so there's no need for multiple gadgets in your sewing room. Embroidery sewing machines are perfect for every stitching project from hemming a skirt to stitching personalized gifts, to monogramming a jacket. Embroidery machines from HSN allow you to make ordinary objects into unique, perfect gifts that are beautiful works of thread art.